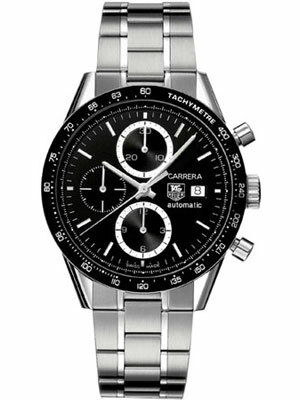 The CAR2110.BA0720 TAG Heuer Carrera Calibre 1887 Chronograph Men’s Watch is part of the latest additions to the Carrera line, and was recently debuted at the Basel Fair in Switzerland. A sophisticated timepiece not yet available to the public, this watch is sure to go quickly when it is released in June of 2010. 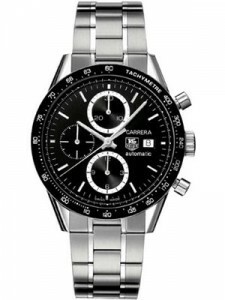 The TAG Heuer Carrera Calibre 1887 Chronograph is a great contemporary sportswatch that offers consumers a great deal of variety. Buyers can choose between either a black or silver dial, and both styles can be matched with either a black alligator strap or a 5-row polished and fine-brushed stainless steel bracelet. The watch also features three chronograph subdials: the hour is found at 6 o’clock, the seconds are found at 9 o’clock, and the minutes are found at 12 o’clock. At 6 o’clock there is also a date window. All of the indexes are hand-applied, and the hands are all polished. Additionally, the hour and minute hands are luminescent. Other features of the Carrera Calibre 1887 Chronograph include its polished stainless steel case and polished bezel that has a tachymeter scale. The crystal is domed sapphire and has been treated on both sides with anti-reflective coating. It has a polished stainless steel crown, as well as polished stainless steel push buttons. The caseback is a scratch resistant sapphire crystal. The watch is water resistant to 100 meters.